finally put custom painted plastic on her, and full floating ss rotors, painted tank myself to match color. also painted custom flames onto cans. new double buble tanted windscreen to go with the black look. fixing to sell off yellow rear plastics (great condition still) have an extra stock belly pan (gloss black ). also have the inner air direct fairing pieces to sell. oh as well the middle piece (yellow) front fairing below windscreen is also good to sell. looks like I will have to upload individually. Last edited by wsharpman; 01-24-2013 at 01:52 PM. Chinese plastics? If so how was the fit and quality? oh I did adjust the tabs and all still though took a bit of work. but I also assume it may have been from plastics being new as well as the cold here, as plastics and cold weather makes for a bit of a stiff deal lol. Last edited by wsharpman; 01-25-2013 at 10:24 AM. looks real good man glad you got her fixed up. Been toying with the idea of getting some chinese plastics too. I can see now they aren't that bad. Also note our bikes come from there lol. My VTR is made in Japan, not China. Big difference!! I have the same plastics for over a year now and they have been great. Installed them by myself with no problem. Did have to come up with some different screws to attach headlight assembly and maybe a few others, but nothing I didn't already have laying around. The plastics were good quality, though thinner, and paint was excellent(red). First - Japanese are professional manufacturers and as such they have factories all over the world, not only in Japan, which means there standards have to apply to many regions and highest quality. Second - They are also regulated very strictly and don't employ unprofessional labor and children for that matter which is the reason why their products are not cheep. A chines manufacturer can be one day car parts factory and the next day hard wood floors factory or clothing factory. They are not dedicated manufacturers for the most part and have very little professionalism as a result. Also they have no factories outside of China so they don't have to apply international law on labor abuse such as child labor, pay, work hours and so on... They barely make it to US and EU standards to begin with on a very small product list if you compare it with their illegal manufacturing, from VTR parts to pharma products. Chinese workers and factories often have no idea what they're making, or why they're making it. It's pretty tough to QC a part when you don't know what it's for. In my work I see a bit of that end of things and it absolutely cracks me up sometimes when they get things wrong b/c they don't really understand what they're making. It's a little scary, but then what isn't? well NHSH sorry bout the bloop... As for child labor I cannot help that as I am no politition nor care to be. So as far as getting my plastics and cheeper I say great.. Can only do what I can. Lol so stop harshing my mellow lmao heh heh. No problem was not trying to be harsh, just correcting I had to deal with Chines manufacturers in one of my business adventures in the past. Was not fun and too risky. I was really happy with the ghosted in red and silver flame concept and suprised that the flames matched perfectly on both sides (evenly). these flames are done in a type of fine metalic paint so that when the sun hits them they show up good. oh and most importantly wax, I bought a spray bottle of turtlewax black detailer man is that stuff good it actually does what it says and leaves a "wet look" shine to the plastic. Last edited by wsharpman; 01-25-2013 at 04:11 PM. I was considering the exact same fairings at one stage, looks good. Last edited by wsharpman; 01-25-2013 at 05:47 PM. 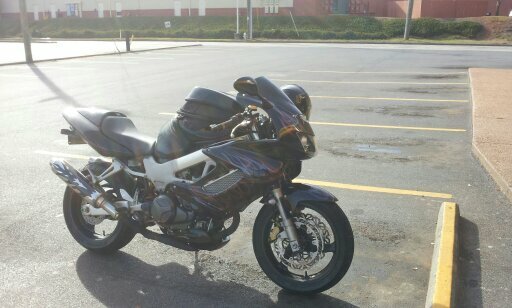 New Hawk owner...help me make it look like some of the sick ones ive seen!